I am sitting on the carpet, staring up at an impossibly high ceiling, where giant brown beams criss-cross. 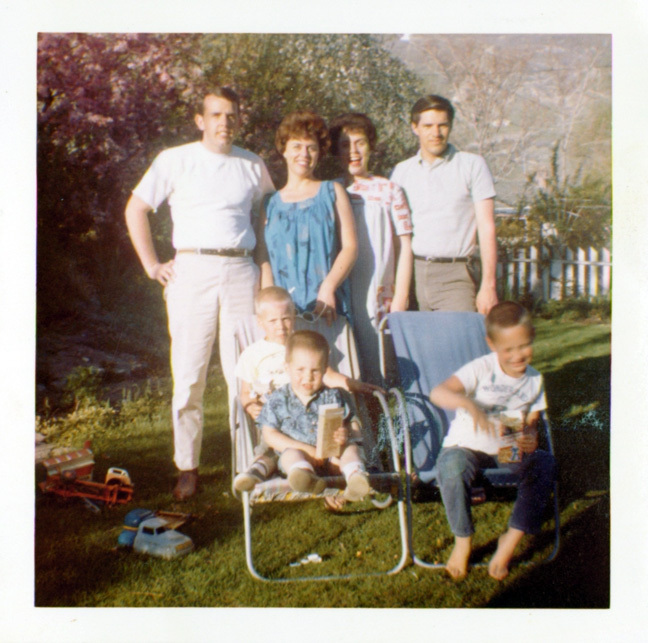 My Aunt Joanie and Uncle Cliff stand over me – she on the left, he on the right – and my uncle isn’t wearing a shirt. He has a hairy chest and smiles, talking to my Aunt Joanie while looking at me. I am sixteen months old. For a long time, neuroscientists thought toddlers couldn’t have any serious long-term memories before the age of three, but most of that research has been upended – you can certainly have them, but they can be eradicated pretty quickly. I’ve always kept Lucy’s memories afloat from the time she began speaking, but now that she has turned six, I’m interested in which things are actually going to make the cut. I have no idea why an odd, seemingly-uninteresting tableau of my aunt and uncle is my First Memory, but the details surrounding were verified later by both parents and Joanie, and the beams in the ceiling date the memory to a specific trip. Joanie and Cliff’s house had exactly those beams at the top of an open-space living room, and we visited them once in that house before they moved. All things bein’ equal, I’ve got a pretty good memory of the distant past, and can recall vivid details of age of 2 and 3. If I live long enough, I could be one of the last humans with visceral (albeit vague, wispy and toddler-ish) memories of the 1960s. But that still leaves entire swaths – like age 6 to 9 – which might as well not have existed. There’s something fascinating in there somewhere, but for research’s sake, let me leave you with this question: what is your first, somewhat verifiable memory – and how old were you at the time? I have an earlier one that can’t be dated as precisely, but in it, I am riding in a big white 1960s car back to that same 5th Avenue house. I may have been with my dad but that I am not sure about. I learned to read when I was 2, and I always figured that made it easier to hold on to memories like this, because I am one of those people who visualizes words, and having words to visualize makes it easier to remember things. Driving down the long sandy driveway to the house we rented in Ocean City MD. I was 4, I think. I think I was around 3 and we were living in an apartment for a few months because our house was being renovated. I remember pricking my toes on the edge of ugly, orange shag carpet that wasn’t tacked down correctly. I also remember riding my “ollie”, a banana shaped toy that had eyes and red yarn hair, over speed bumps in the apartment parking lot. It must have been 1975 or 76′. I also know that’s when I first have real memories of Salem. June 17, 1972. I’m 3 and a half. My brother David has just been born, but he and my Mom haven’t come home from the hospital yet. Hurricane Agnes has caused severe flooding in our small Pennsylvania river town, and the waters crested yesterday while Mom was in labor. I’m standing by the railroad tracks at the top of the hill by our house, looking downhill at rowboats on our flooded street. The water came all the way up to the tracks and stopped just 15 yards from our house. Our dirt basement turned to mud, but we were otherwise lucky. The Great Flood of ’72 is still spoken of in respectful tones in certain parts of Pennsylvania and New York State. It makes sense to me that the flood and my brother’s birth are forever entwined as my first memory. I know I was a baby b/c I remember my older brother, who was 17 years older and going off to UNC. I remember him with his bags saying “Say go Tar Heels! !” to me and everyone looking at me saying “Say Go Tar Heels!” and I couldn’t say it but was saying it in my head. My mom and dad were at the door by the kitchen with my brother and they were all looking at me saying that and I was standing on the sofa looking over the top at them and babbling. That’s all I remember! I clearly remember watching the moon landing with my parents. 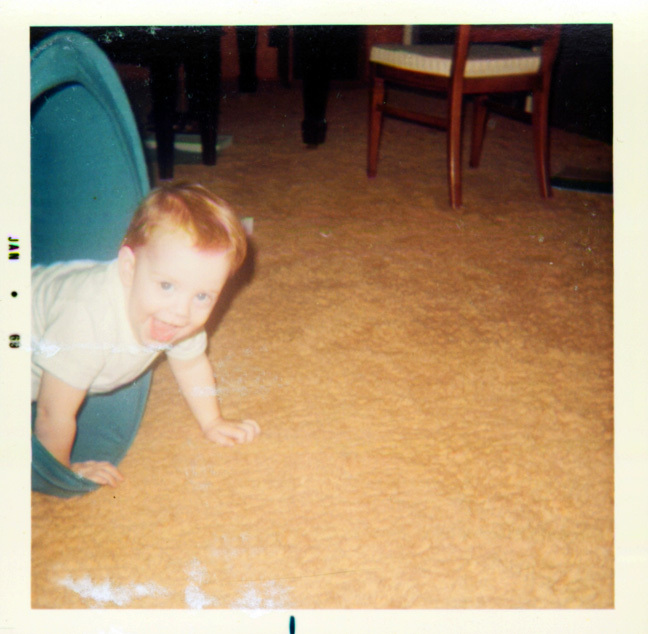 I’m 2 years, 9 months old, sitting on the floor playing with my Apollo rocket & moon lander toys. I have a few other memories from around the same time, but the moon landing is the best one. 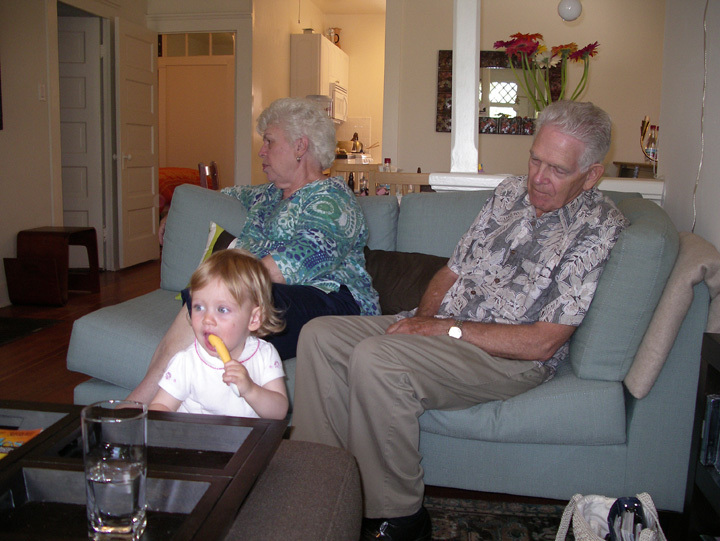 I have crazy-good recall of life events going back to pre- age 2. I remember pulling myself up via the side bar on my crib and standing in my shade-darkened bedroom, calling for Mama to come get me after my nap. I had a poop in my diaper at the time. I was probably 15-18 months old. 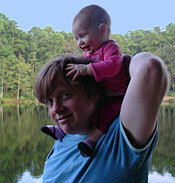 At around the same age, I recall riding on my daddy’s shoulders outdoors and feeling SO tall, almost in a scary way, but fun too. I can date these memories because they took place at our house in North Dartmouth, MA, and we moved to Illinois when I was just 3. I remember the house’s rooms, layout, furniture, and parts of the yard. I remember the little toddler boy down the street who would come over to play with me while our moms had coffee and gabbed. Age 2 years and one month: My new baby sister arriving home from the hospital, lying in a wicker basket. Event, date, and basket, verified by my mother 20 years later. Aunt Joanie has your face! I remember living in an apartment in Edison, NJ. One day, someone hung a sheet out to dry over a railing, and it hung down in a half-moon shape, and I told my mom that it looked like a boat. For some reason I remember that. I don’t know how old I was, but I think I was about 3. Another thing to look at is the earliest memories of world events. Mine are the bicentennial celebration and the election of Jimmy Carter. I was 5. I also remember watching the ’76 Olympics with my cousin and my great-aunt’s house in Elizabeth, NJ, on the big TV set on the floor. And Hurricane Belle. So even though I have scattered memories before that, I guess age 5 is when I really became aware of the world outside my house. My earliest memory is caveman making me do tequila shots at Henderson Street Bar at Chapel Hill in August of 1997. It was my 26th birthday. Everything before that is blacked out. Wow, I’m surprised by so many young memories. The first one I’m sure of is when I was 5 (by just a couple of day). We were moving to England and I remember watching planes take off from Dulles with my Grandma standing behind me. She was reminding me that England wasn’t all that far away and that they would come visit. I think I’d be sad if I came up with another ‘first’ memory, because I cherish this one. Grandma isn’t here anymore and it’s nice to think back to that time when she was pretty young and vibrant. July 4th 1974 – i was 2 and a half & my dad took me to the university of florida football stadium – the swamp – for the fireworks. i completely lost it – i thought the explosions in the sky were bad news and big danger. we had to leave after 5 minutes. 1981-ish, in Birmingham, Ala. My mom had locked her keys in the house, and we were stuck in the back yard. I had to climb through a window in our house and open the back door. I remember landing on a brown dresser, which we had until the bottom fell off during a move to North Carolina. I remember feeling so strange that even though my mom was just on the other side of the door, I was completely alone in our house. I remember this vividly, being on a wide ornate stone bridge with my father in Dublin, I was about 6, and seeing a mother and her daughter (a little younger than me), begging. Being from small town Canada I’d never seen such a sight, and when Dad explained I was mortified. I went over to the little girl and handed her my shiny red plastic purse, which had a fist-full of pennies in it and trinkets a 6 year old would carry, and then took off my coat and shoes. My Dad made me put my shoes back on but left me give her the coat. Then I remember walking past green double decker stops, and Dad explaining he gave the woman all our cash and had no bus fare, and we’d have to walk. I remember the misty air and heavy pink flower blooms hanging over stone walls as we made our way back to my Aunt’s house. That image is burned in my brain and affects me to this day. I can’t date the original memory for sure, but my Mom says I was probably ~15 months, as it was the summer after I turned one. I remember her hands on my back while I stared at the ceiling way, way above and I floated in water. I remember terrible, terrible pain. Turns out she took me to the doctor afterward – I had a loose piece of wax in my ear slamming into my ear drum or something. I just remember the hands, water, ceiling, and pain. So, uh, pretty sweet first memory. I’m always suspicious of super early memories. Maybe it’s just that my own long-distance memory is so terrible, but I think memories are rewritten every time you recall them. And anything that makes it through the tumult of a developing mind seems impossible. Is it really a memory? Is it a reminiscence you heard? A photo you saw? I know my own earliest memory can’t be real, even though it’s accurate. I’m in the dining room. I can see the back of a wooden chair, and I know behind me is a picture window. But we moved when I was one, so this memory can’t possibly be real. I assume it’s based on a photo, but it feels like an experience.